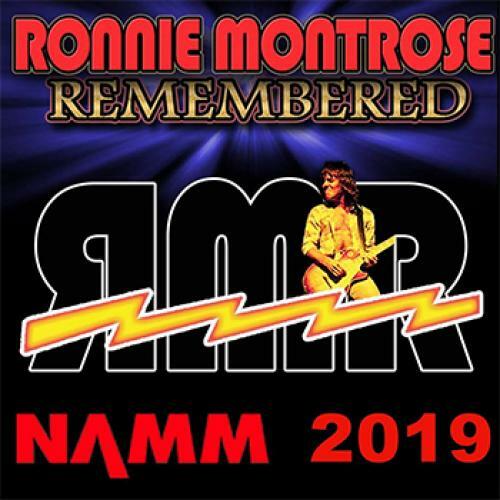 HOWLLYWOOD, CA (January 10, 2019) – NAMM’s most anticipated concert “Ronni Montrose Remembered” will kick-off Friday, January 25th at the M3 Live Anaheim Event Center. This All-Star extravaganza is hosted by none other than the Metal Guru himself: Eddie Trunk. The incredible all-star featured performers include: Jack Russell’s Great White; George Lynch (Dokken / Lynch Mob), Doug Aldrich (Whitesnake/Dio); Tracii Guns (LA Guns); Frank Hannon (Tesla); Keith St. John (Montrose/Kingdom Come); Dave Amato (REO Speedwagon); Derek St Holmes (Ted Nugent); Paul Shortino (Quiet Riot/Rough Cutt/Spinal Tap); James Kottak (Scorpions); Robert Mason (Warrant); Randy Jackson (Zebra); Phil Demmel (Machinehead/Slayer); Mic Mahan (Pat Benatar); Andrew Freeman (Last in Line/Offspring); Mitch Perry (Edgar Winter Band); Brent Woods (Sebastian Bach); Brad Lang (Y & T); Sean McNabb (Dokken/Quiet Riot), Jeff Kathan (Paul Rodgers Band); Marc Bonilla Keith Emerson Band); Jimmy Paxson (Stevie Nicks/Dixie Chicks); Jimmy Degrasso (Ozzy Osbourne/Ratt); Jim Wheeler (Loggins and Messina); Ed Roth (Annie Lennox) - More artist’s being added daily!